« Blogging while delivering triplets! I might be the last person to know this, but Tuesday is the most productive day of the week. I was alerted to this fact by this blog post, which pointed to some research by Robert Half International. But then when I went to dig in deeper, Tuesday-is-the-most-productive-day-ever was all over the Internet. This article says that in 2002, 1998 &1987 the data showed the same thing – Tuesday is the most productive day of the week at work. Here’s a piece from 2002 talking about how Tuesday is the best day to get work done. 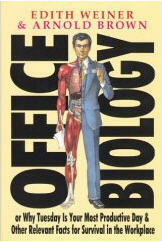 And then there’s this 1994 book: Office Biology or Why Tuesday Is Your Most Productive Day and Other Relevant Facts for Survival in the Workplace . There is a whole book about how Tuesdays are so productive. How could I have missed this incredibly important fact for all these years? I have to admit, I was a bit skeptical at first. I wasn’t really sure that Tuesday was my go-to day of productivity. Then I was reading a post by Steve Rubel on his Micro Persuasion blog about becoming an expert, and in the post, Rubel included a chart of his Google Reader reading habits. 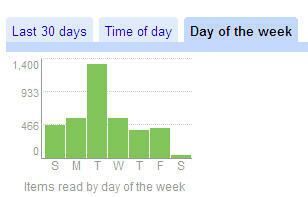 And then it dawned on me that I should check my stats in Google Reader to see what they showed. Those big spikes? Those are Tuesdays! And just for fun, here’s the time of day chart. Anyone who knows me well – or ever worked with me – will not be surprised at the early morning lull. So what does all this mean? For me, it means that it’s time to take some deliberate action. If I am more produtive on Tuesdays, I’m going to be proactive about keeping that day as productive as possible. I am not going to schedule meetings on Tuesdays, for example, because meetings break up the flow of my day. And I plan to complete one major, sticky, important-but-difficult or important-but-boring project every Tuesday. I’ll keep you posted on the progress. What do you think? And what do your *Trends* show? Is Tuesday your go-to day? *If you use Google Reader, you can find this data by clicking the Trends link at the top of the left-hand navigation in Google Reader. This entry was posted on Thursday, May 8th, 2008 at 12:38 am	and is filed under Google, Management, Productivity, Project management. You can follow any responses to this entry through the RSS 2.0 feed. Both comments and pings are currently closed. I’ve cleared all meetings and emails from next Tuesday’s schedule. This coming week, I’m going to make Tuesday count, and take Wednesday off. Great article! 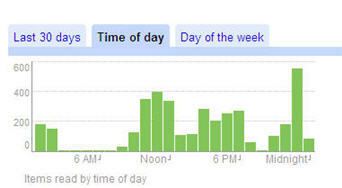 Does more Google Reader mean you’re more productive? It could just mean you’re procastrinating.